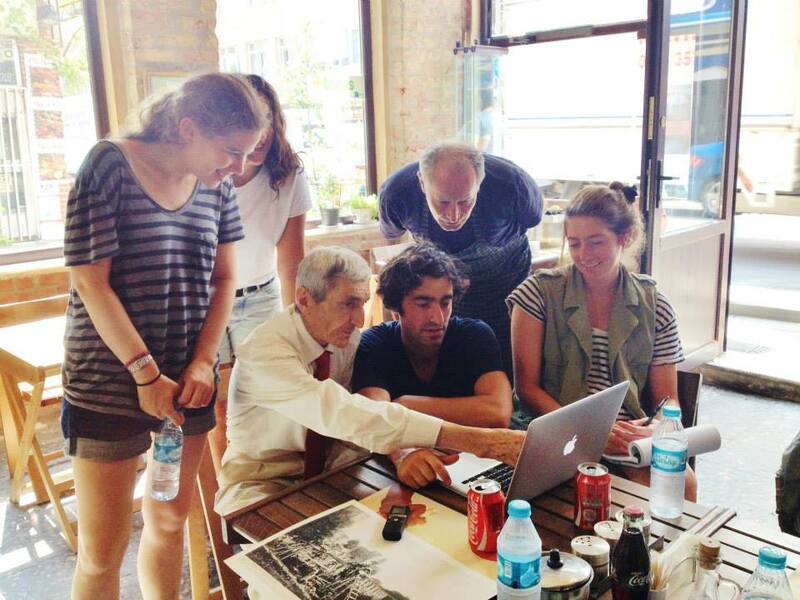 Students talk with Riza Bey about his garden near the Yedikule walls. He also shared some wonderful personal photos with us. 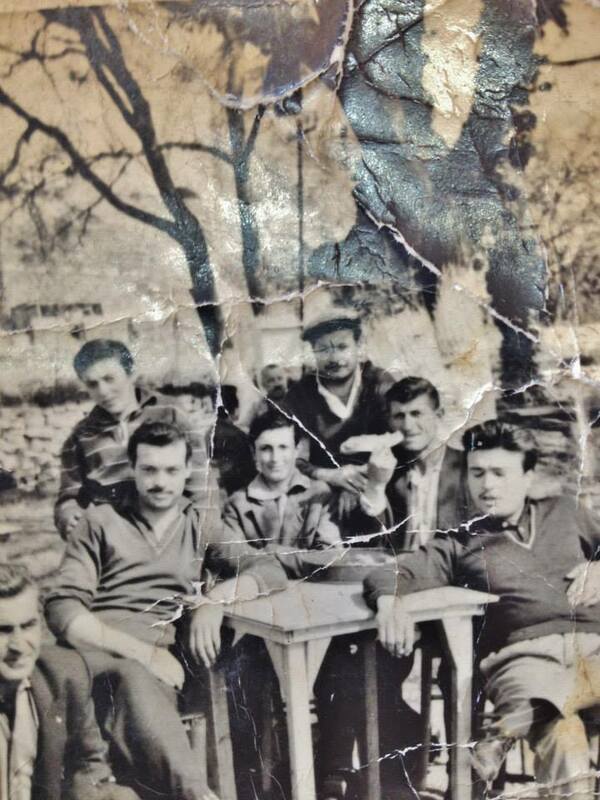 Riza Bey and other Yedikule gardeners and residents at “Crazy Toma’s” lettuce garden, 1963. Man at middle-right is holding a lettuce leaf. A bittersweet return to “Crazy Toma’s” lettuce garden, now a mosque. 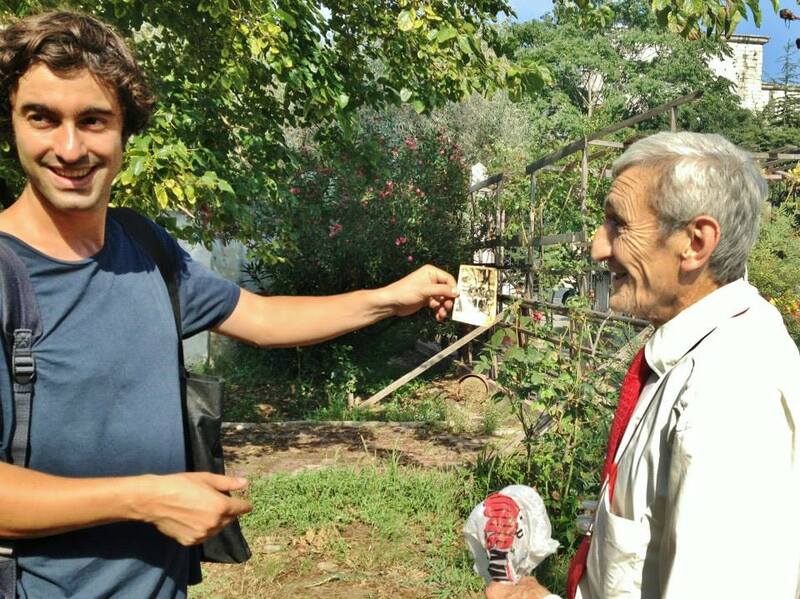 In our visits to Yedikule Gardens we had encountered some basic types of vegetables. In July, for example, we might find purslane (in Turkish Semizotu) in the gardens we had visited. Purslane or vegetable porcelane (Portulaca oleracea) is a species of plants with creeping stems, often considered a weed, although it is cultivated for food and used in herbal medicine. It is annual and very common in gardens. It grows best in warm areas particularly in the south. Purslane grows throughout Turkey-İstanbul and in all warm and temperate regions of the Earth. It is found both in Europe and Asia, America or Australia. Nevertheless its specialties might differ from region to region. Greeks call andrakla (αντράκλα) or glystrida (γλυστρίδα) as they fry it in olive oil leaves and stems with feta, tomatoes, garlic and marjoram. 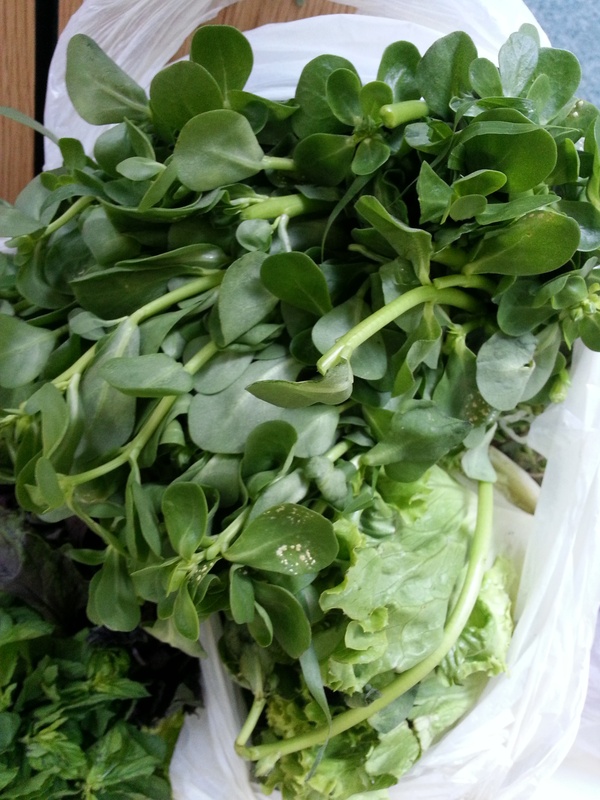 (I had tried it in Thesseloniki last summer, in July) Young stems and leaves of purslane are eaten in salads, and sour taste gives a little twist. In Turkey it is used in salads but also tends to replace the spinach because it is easier to prepare. For vegetable growing, there is a form with large leaves one gold leaf varieties and varieties with pink or white flowers grown for ornament. (We cannot find this type in Yedikule Gardens) It may also be cooked in a soup or omelet. 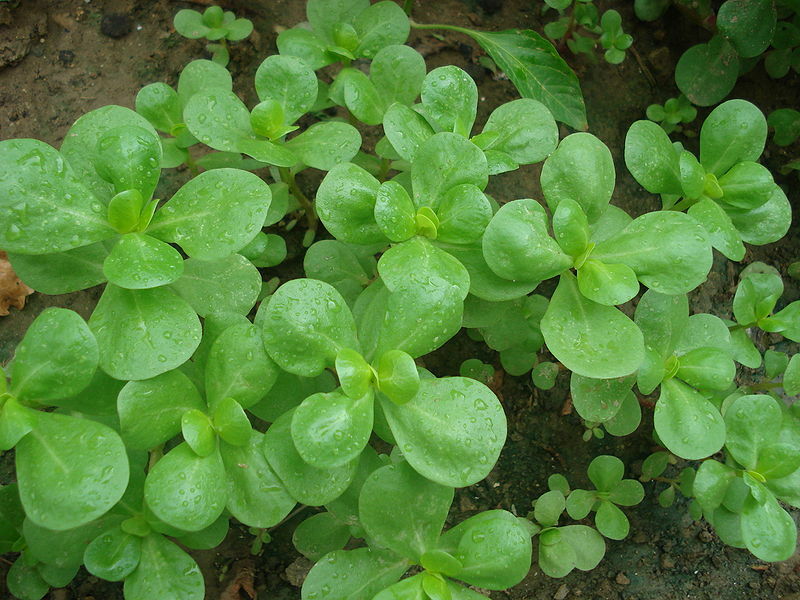 Purslane is laxative, diuretic and beneficial in case of irritation of mucous membranes. Therefore it is a vegetable used in many dishes based on the other product that might be found in that region. Nevertheless I believe cooking purslane like spinach might demolish its vitamins and reduce the portion of the meal. Using it as a product for salad might be more meaningful if we would like to feed a big family. For big families, cooking meals in big pots with lots of ingredients might be a good way of feeding the family easier and escaping the time wasted on cooking. Ottoman families were also known by its large population including some members from outside the family. 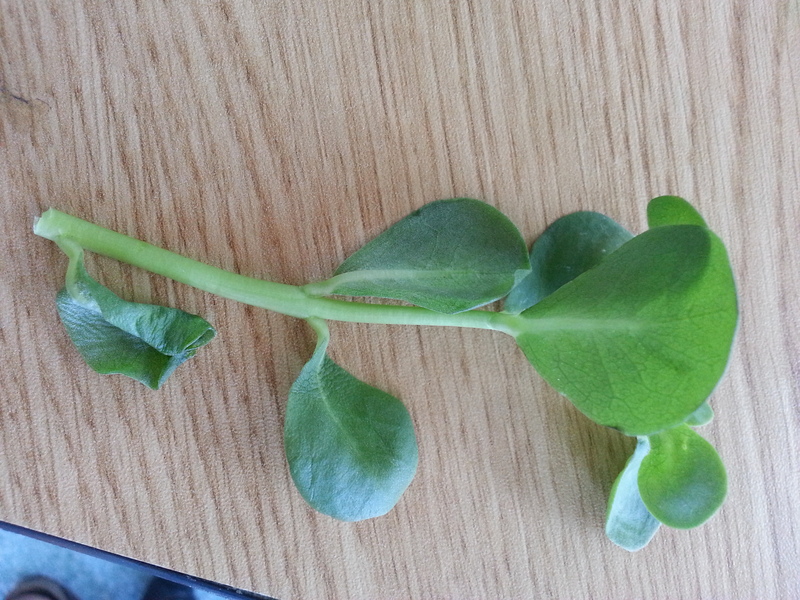 I wonder how did cooking the purslane and reducing its portion have become a way of using it. In pragmatically and anthropological aspects I could only give one answer to this problematic. As I mentioned before, maybe the type of purslane differs from region to region and Ottomans had found it more useful to cook. It might be about the proportion of the water inside the plant which had grown in İstanbul. Nevertheless cooking purslane might be a coincidence of cooking culture synthesis. In other words Ottoman families who are used to feeding their family by cooking in big pots might have put the purslane that they had planted in their gardens. In this way they had skipped its usage in salads which might show us how cultural and social facts had influenced the pragmatically and useful solutions in a bad way. By explaining this dilemma I would like to focus on the bad inducement of social, economic and cultural issues in contrast with ecological aspects. In the case of the usage of purslane, I believe the pot cooking culture of Ottoman-Turkish had skipped the importance of the vitamins inside the purslane and diminished the possible portions of purslane for families. In this paper by considering last session on activism I would like to pay attention to the influence of socio-cultural issues on ecological perception of individuals. Common purslane, Portulaca oleracea, is a member of the Portulacaceae family with more than 120 different species found in that family. It is also known as pigweed, fatweed, pusle, and little hogweed, is an annual succulent herb in the family Portulacaceae that is found in most corners of the globe. Purslane was one of the most widespread plants in the world since distant times. Purslane / Portulaca Oleracea / Semizotu. Purslane is a native of Persia where it was used over 2,000 years ago. It was introduced to North America from India and Persia. The Arabs in the Middle Ages called it baqla hamqa, which means “mad” or “crazy vegetable” because of the fact that its branches spread over the ground without any control. In Spanish, names such as verdilacas, yerba aurato and yerba orate are known (which again mean “crazy herb”). Nowadays it is distributed over the hot temperate zones of a great part of the world. Together with other species of the genus it occurs as a weed in the majority of tropical and subtropical countries. The purslane is suitable for light (sandy) and medium (loamy) soils and prefers well-drained soil. It requires a moist light rich well-drained soil in a sunny position. Plants will not produce good quality leaves when growing in dry conditions. The soil should have soil pH of 5.5 to 7. Purslane flowers grow at the tips of the fat stems from late spring through late summer. The flowers typically open from mid-morning to early afternoon on hot, sunny days. Flowering takes place from May through September. The yellow flowers give way to small, dark, pointed seed capsules that, when mature, break open and release an abundance of tiny, black seeds, each about the size of a grain of sand. Seeds are tiny, less than 1/25 of an inch (1 mm) in diameter, circular to egg shaped, flattened, and brown to black with a white point of attachment. Numerous seeds are produced. Common purslane is edible, with a sweet, yet acid-like flavor. It has been cultivated in India and the Middle East and has been popular in Europe since the Middle Ages. It can grow alongside roads, in crop fields, gardens, vineyards and orchards, in construction sites and other disturbed areas. It was categorized in the Mediterranean countries of the Near East and central Asia as a weed and vegetable. For Istanbul and Turkey, due to its suitable conditions and also its acceptance as something edible, purslane has an important place. Therefore, not surprisingly, in our field trips for this class, at every functioning garden in Yedikule and walled-city, we saw huge amounts of purslanes. Today, purslane is known to be antibacterial, antiscorbutic, depurative, diuretic and febrifuge. The leaves are a very rich source of omega-3 fatty acids which prevents heart attacks and strengthens the immune system. How about before? Via looking at some sources the way it was used and its importance can be discussed. It is mentioned in the “Natural History” of Pliny as one of the vegetables used by the Romans. Pliny, or Gaius Plinius Secundus, usually referred to as Pliny the Elder, was a Roman living about 23-79 A.D.  Also, one of the richest sources that can be used is the Geoponika since it is referencing other sources. In Geoponika, Purslane was mentioned a few times for its different usages. Taken from Varro, it is said that some vines fruit normally but not their grapes before they have swollen and ripened. These should be cured with purslane juice. From there we can see that there is something called purslane juice. Cited from Demokritos, in order to make pomegranates bear plentiful fruit suggests to grind purslane and spurge together finely and smear around the base of the trunk. Africanus proposes for making all trees fruit more heavily rubbing purslane and spurge, mixing and well pounding together, around the trunk is useful. Paxamos claims purslane is applied as a poultice, cures erysipelas. The leaf, placed under the tongue, makes one less thirsty and for particular treatments for poultry one may treats the eyes of fowl by bathing the outer eye with human milk or with purslane juice. According to Apsyrtos, in a case if a horse is feverish and thin from overwork, it is necessary to give- for three days or more, until healthy- a mixture of one kotyle goat’s milk, one metron frumenty, half a kotyle olive oil, 4 eggs, juice of pounded purslane. While searching from the Internet I found this site about the sources mentioning purslane in some detail which I found very valuable and would like to take a part of it as a long quote here: “Columela writes in his poem on the garden: “Already the juicy purslane covers the dry beds”; and in Los doce libros de agricultura: “Leafy purslane appeases the plot’s thirst” (Book X); Paladio refers to it exclusively because of its mucilaginous, medicinal and veterinary properties. Similar references are found in Kastos, taking up the Byzantine tradition. The writers of oriental and Arabic treatises concerned themselves most with this vegetable. Ibn Wahsiyya describes its cultivation in the Near East, presenting it as a summer crop. Most of the Hispano-Arab agronomists deal with this plant. Arib (tenth century) mentions it in his Calendario agricola. Al Zahrawi and Ibn Hayyay (eleventh century) also mention it. Ibn Bassal (eleventh century) deals extensively with its cultivation, already recognizing a certain intraspecific variability, setting out its temperature and water requirements (summer cultivation and irrigation or vegetable garden), drawing up a sowing calendar which extends from March to August and demonstrating the practice of two basic cultivation periods, depending on whether the aim is to produce seed or to produce for human consumption. Sowing quantities and manuring and irrigation requirements also appear and are dealt with in great detail by the author. Ibn Wafid (Hispano-Arab agronomist of the eleventh and twelfth centuries) mentions it under the names baqla hamqa’ and missita. Ibn al-Awwam, in his Kitab al-Filaha, recalls that it is mentioned by almost all the Arab authors and refers to different varieties. He uses the adjectives “mild”, “vain” and “blessed”. Through the research I also learned that the thing I know as semizotu (purslane) has different names. 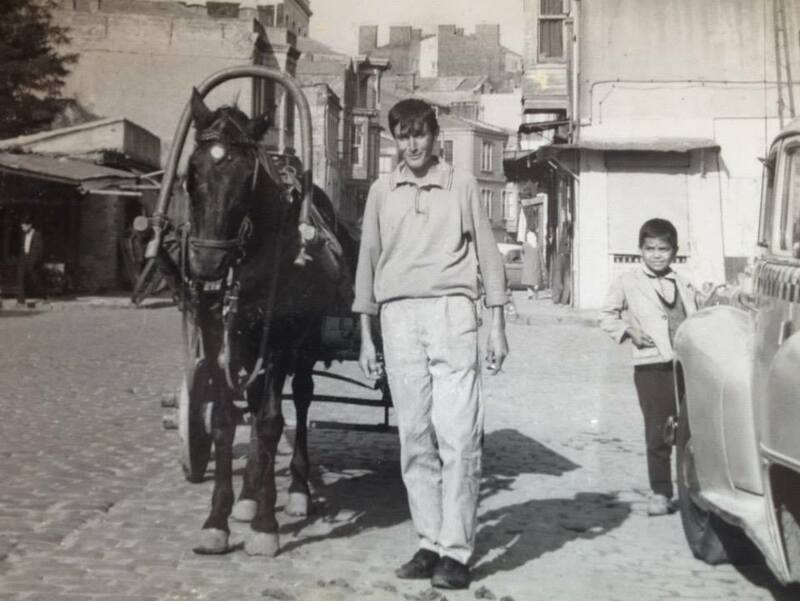 For instance in Mersin it is called tömeken, in Elazığ, Urfa and most of the Aegean cities it is called pirpirim, in Adana it is soğukluk, in Malatya it is known as pırpır, in Karaman, the name is töymakan, around Tunceli it is perper and in some places around Mediterranean it is tohumeken. Some of the names are different because they are wild variations of purslane that we have in Istanbul, but it turns out the names are also used interchangeable at some point. My relationship with semizotu is a long and very intense one thanks to my mother’s “we should eat some healthy things” attitude. The semizotu salad made with yoghurt is a loyal member of our dinner tables. Also, semizotu is something like spinach for Turkish people. Even the recipes for the way they are cooked are very similar. One can make a salad out of it with or without yoghurt, or use it as an ingredient for börek or poğaça (roughly translated as pastry), it can be the main ingredient of soup or part of a vegetable soup. Moreover, of course, there is a vegetable dish made out of it that the ingredients can change according to cook’s wish or the equipments present at the moment of preparing it. At this point, I would like to add one of the delicious salad recipes that can be made with Purslane. 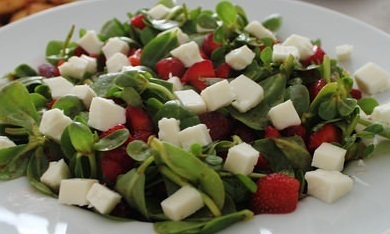 Purslane Salad with Strawberries and Cheese. Clean the purslane and wash it with strawberries. Cut the non-leaved parts and separate, then chop rest of the material and put it in a bowl. Cut the strawberries in the half and dice the cheese. Then add them to the bowl along with the walnuts which should be also cut in the half or even smaller. Add the olive oil with the lemon juice. Mix all the ingredients. Put them in a salad bowl and before you serve add the pomegranate syrup. Voila! P.s: You should prepare the salad not long before you serve it since the strawberries would be ruined otherwise. And also if you plan to serve it after some time, you should not add the lemon and olive-oil until the last minute. Bassus Cassianus. “Geoponika: Farm Work: A Modern Translation of the Roman and Byzantine Farming Handbook.” (Totnes, Devon: Prospect Books, 2011), 143. For this paper, I chose to look into the history and usage of purple basil, which we found both in the bostan in the church grounds near Yedikule and also in the bostan further north at the mouth of the Black Sea. The name “purple basil,” I have found is far more colloquial than scientific. Technically, Ocimum basilicum, “Purpurascens” was first identified by British botanist, George Betham, in the 1830s (DeBaggio, 2014). In fact there are several species of purple basil, including some that grows in tiny leaves in Thailand and another found in the mountainous regions of north America. 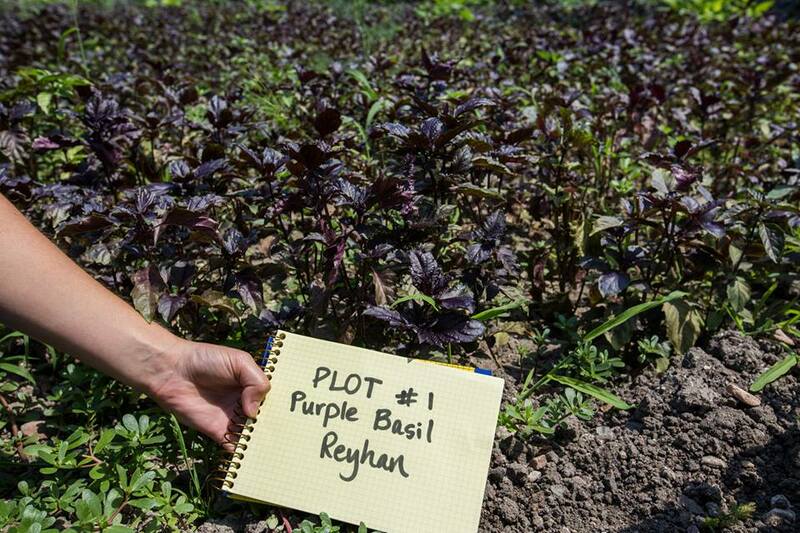 At first, I thought there were just two types, the Ruffled and Osmin Purple Basil, and I tried my best to identify which of the two our selection was. I don’t think my analysis was as detailed as it would be without live specimens, proper leaf indexes or detailed descriptions on the differences in species. Therefore, I cannot specify what type of purple basil we found here in Istanbul. 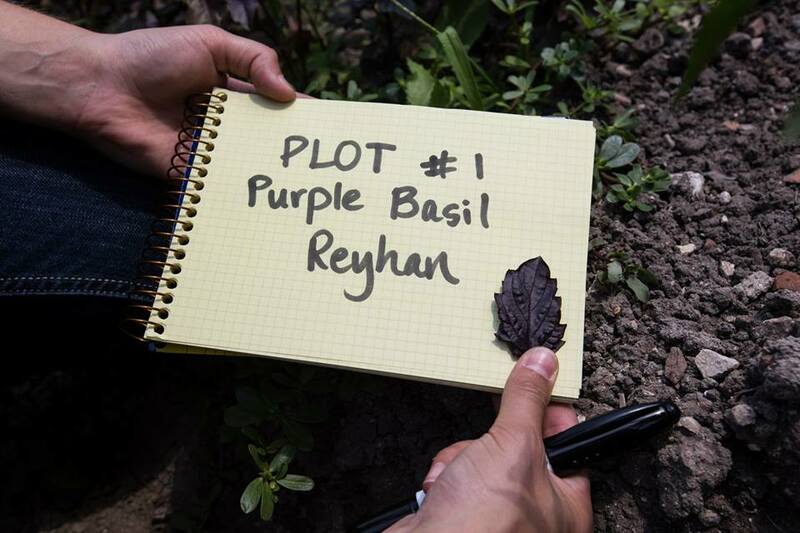 Research on the origins of purple basil also posed some challenges. The basil is made purple by the heightened presence of anthocyanin, a purple pigment. Within the genus of purple basil, there is great discrepancy over the taxonomy when it comes to the species and their origins and nature (Phippen, 2000). In my search for both the origins and arrival of purple and regular green basil in Istanbul, I also didn’t have much luck. I decided to therefore look into the sources given in our class. In the Geoponika, dated back the10th century, I found in the 14th chapter of the 12th book a small paragraph to describe how to best fertilize basil, along with other plants (tl. Cassianus). In the three typika, detailed charters from monasteries and convents of Byzantium in the late middle ages, there was no mention of basil (green or purple) as a plant. There was the mention of a “St. Basil” in the 12th century document (tl. Bandy), and the phrase, “the divine Basil,” as a teacher of God in the 13th century typika (tl. Talbot). Although not plant related, perhaps the origins of their name, reverent in nature, are a result of the productive and fruitful essence of the plant. The leaf part of the basil plant is the only part that is conventionally eaten. The leaves can be eaten whole or dried as a flavorful accent to other dishes. It can also be pureed into pesto, which capitalizes on the plant’s natural oils. Although there are a variety of types of basil within the same genus, there are some wild forms of basil that typically showcase more elaborate flowers and have smaller leaves. Their categorization as “wild” may also be a product of certain strains like sweet green basil becoming a domesticated and a harvested crop because of their fuller leaves and thus higher nutritional output. Purple basil, and its most common types, the Ruffled and Osmin, both thrive in strong sunlight and moist but drained soil (Backyard Gardener). 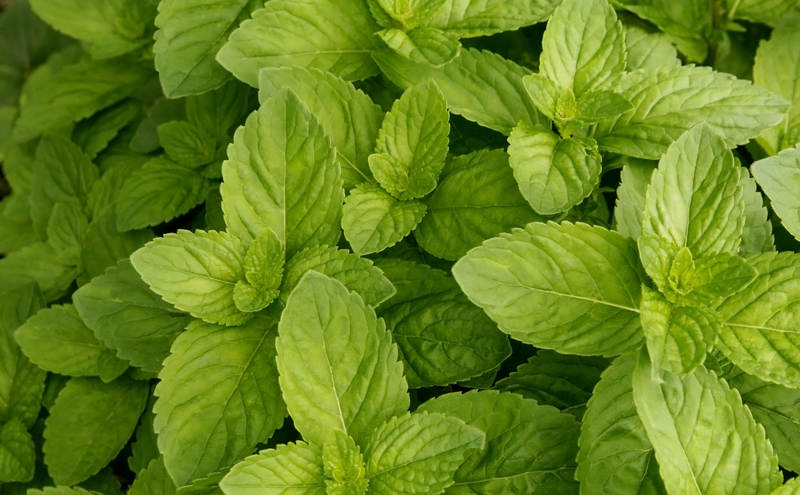 Osmin Basil prefers more humid environments. Purple Basil is an incredibly durable plant, which often grows on the outskirts of a garden in sort of a protective manner. Its variety is shape allows it to be a versatile container plant (Mississippi State University, 2004). When were were visiting the bostan near the Black Sea, we saw purple basil growing vigorously on the outskirts beyond the borders of the intended crop. It was almost weed-like. Although the report on purple basil released from the Penn State states that there are no pests for this plant, the “Backyard Gardener” reports that the biggest problems for the Purple Basil is the whiteflies as a pest and Verticillium and Fursarium Wilt for diseases (Backyard Gardener). When I first saw what purple basil was, since I had never seen it before, I was immediately intrigued by its color. Yes, purple is my favorite, beyond favorite, color. I have had basil before; I grew up cultivating it in my family’s small vegetable garden in Massachusetts, but I have never seen it in purple. Being basically the same plant, I expected it to taste the same as what I knew my green sweet basil back home tastes like. I personally don’t really like basil to begin with unless its mashed up into pesto, so I was even more opposed to the more bitter, almost licorice-like taste of the purple basil. It had a more grainy texture than what I’m used to and, as I said, the taste was a bit less of my liking. My favorite part of the whole experience that took place on the third floor of Woods Hall, was the smell. The fresh smell of basil, or what I could fish out of the other vegetable aromas filling up the room, reminded me of the green basil back home. I was back in my kitchen in the late summer afternoon preparing dinner with my family. Traditionally I have only known basil to be good for pesto and caprese salad. In my research I found that purple basil is complementary with Thai food as well as some Mexican dishes. As for Turkish cuisines, I found an interesting one from a blog called “Turkish Style Cooking.” I’m not sure how legitimate the page is, but we’ll go with it because it’s a fitting title. Plus it’s such an intriguing idea I have to share it. One Turkish recipe involving purple basil is a purple basil sherbet, or sweet drink. It’s looks simple and delicious! (Turkish Style Cooking). Strain with a piece of cloth and chill. From the primary research we did for this blog post, it is clear to me that there is so much more to learn about the biodiversity that surrounds us, growing in the soil of potted plants on the back window sill or in full gardens directly in the middle of a bustling city. Backyard Gardener. “Ocimum basilicum: Purple Delight Sweet Basil.” (http://www.backyardgardener.com/plantname/pd_ada7.html). Cassianus, Bassus, Geoponika: Farm Work: A Modern Translation of the Roman and Byzantine Farming Handbook. Totnes, Devon: Prospect Books, 2011, 9-55 and 246- 267. (https://dl.dropboxusercontent.com/u/5111268/Harvard%20summer%20school%20readings/Second%20Week/Dalby%20A.%2C%20Geoponika.pdf). DeBaggio, Thomas. “Growing Purple Basil,” Mother Earth Living. May 2014. (http://www.motherearthliving.com/gardening/purple-basils.aspx#ixzz39RzeXumW). Histil. “Ocimum basilicum purpurascens.” 2014. (http://www.hishtil.com/htmls/page_916.aspx?c0=18157&bsp=18222). Mississippi State University: Office of Agriculture Communications. “Awards selection committee chooses Purple Ruffles basil.” April, 2004. (http://msucares.com/news/print/sgnews/sg04/sg040415.html). Turkish Style Cooking. “Purple Basil Sherbet Recipe.” July 2014. (http://www.hishtil.com/htmls/page_916.aspx?c0=18157&bsp=18222). Typikon of Athanasios Philanthropenos for the Monastery of St. Mamas in Constantinople (trans. Anastasius Bandy) (http://www.doaks.org/resources/publications/doaks-online-publications/byzantine-monastic-foundation-documents/typ043.pdf). The tomato (domates), while often associated with Italy and its cuisine, actually originated in the Andean region of South America. The exact date and location of the tomato’s domestication is unclear, but scientists believe it was probably first domesticated in what is now Peru and later brought to Mexico. Spread of the tomato beyond Central and South America began in the 1500s with the arrival of the Spanish conquistadores, who learned about the plant during their colonization of the continent. They introduced tomatoes to their various colonies in the Caribbean and brought them back home to Spain and to the rest of Europe, where they grew particularly well in southern Mediterranean climates like Italy, Greece, and Turkey. However, because the conquistadores could only bring home a limited number of seeds and plants, they created what geneticists call a “bottleneck or serious reduction in population” that resulted in lower genetic diversity, meaning the domesticated tomatoes growing in Europe were likely to have damaged genes, making them “slower-growing and frailer than their wild kin.” Scientific advances have allowed plant breeders and genetic biologists to work on crossbreeding domesticated tomatoes with wild ones that have a thick, waxy skin that would allow the plant to retain water better. However, tomatoes were not always known for the sumptuousness with which we associate them today. While we know that the Aztecs were eating tomatoes by 700AD, in many parts of Europe – particularly countries in northern Europe, such as Britain – tomatoes were considered highly dangerous, and were therefore grown mostly for aesthetic purposes; consumption was avoided. While it is true that only the red fruit is edible and that all other parts of the plant are toxic, the tomato’s bad reputation extends beyond its legitimately poisonous vines. Many wealthier Europeans feared tomatoes because when a tomato (a highly acidic food) was eaten off a plate made of pewter (high in lead content), a chemical reaction occured and the lead would leach from the plate onto the fruit, causing lead poisoning. The true problem – pewter, or more generally, chemistry – was not recognized until many years later, at which point the tomato was exonerated. Finally, the tomato’s scientific name – Solanum lycopersicum – itself promoted fear: “solanum” relating to the deadly nightshade plant which the tomato closely resembles, and “lycopersicum” meaning “wolf peach”. Tomatoes grow well in South America, the Mediterranean, and the Middle East because the climate is perfectly suited to the plant’s needs. Tomatoes require copious direct sunlight and warm weather; their seeds germinate in temperatures of 68-80 degrees Fahrenheit, and consistent temperature between 65-75F is ideal for plant growth. Anything cooler slows down growth time, and any hotter calls for more frequent watering. A tomato plant needs a moist (but not sodden) environment, so it is important to water it whenever the soil dries one to two inches. Tomatoes like well-drained soil with fairly neutral 5.5 to 6.8pH, but loam – a soil composed of sand, silt, and clay – is frequently cited as the best because it drains easily and heats up quickly. Before planting tomatoes, one must “harden them off” – meaning, get them used to the outdoors and the night’s cold by placing them in the shade during the day and covering them at night for about a week. Seedlings are ready to be planted outside when they are approximately six inches tall, and they should be planted 18-36 inches apart from each other. While chemical fertilizer can be used, some gardening manuals recommend using kelp meal and bone meal as natural fertilizers. Some “old-time” gardeners will even toss in a tablespoon of Epson salt (for magnesium) when transplanting. Additionally, some people will “solarize” their soil by covering the plot with plastic to maximize the sun and heat before transplanting – solarizing also helps prevent disease, such as verticillium wilt. Fruit appears about 60 days after transplantation, and will start out small and green before ripening to a deep red. 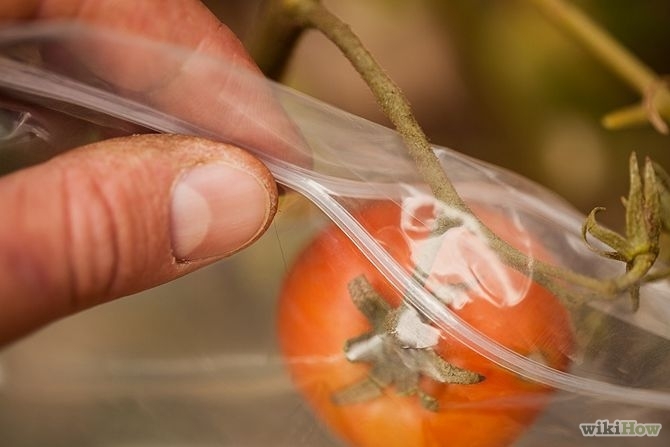 The plant can be protected from pests by putting a clear plastic bag around the fruit, leaving a slight opening for airflow. The damage done by insects, however, is “generally minimal compared to the damage done by spreading diseases by the insects.” Therefore, the best way to prevent disease is to reduce the number of insects by removing the weeds around the tomato plants, where insects tend to breed. Geoponika, a 10th century Byzantine farming manual, was compiled before tomatoes were brought to the region in the 16th century, and thus contains no references to tomatoes, which were not a food of the classical world. However, Book V discusses various farming techniques regarding vines, some of which relates to the tomato. 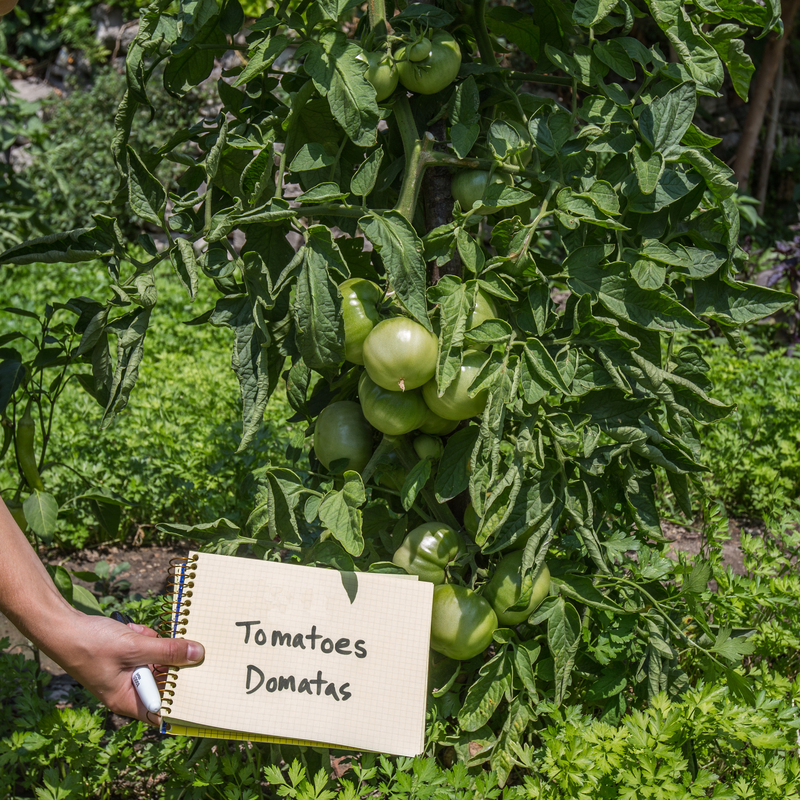 For instance, Book V 22 discusses the importance of pruning and the use of a “vine-prop” not unlike a tomato stake, which not only provides the tomato physical support but also helps prevent disease. It would be a challenge to grow up in the United States and be somehow unfamiliar with tomatoes or tomato-based products. The tomato is a quintessential ingredient in most salads, and is commonly sliced onto sandwiches and burgers. Ketchup – a tomato-based condiment – is slathered upon all manner of fast food, while “spaghetti with tomato sauce” is a staple of every restaurant’s children’s menu. Tomatoes comprise the bulk of dips and salsas, and tomato juice can be drunk plain or with vodka as a “Bloody Mary.” Tomatoes even have (so it is thought) miracle restorative properties: most people have consumed Campbell’s Tomato Soup at least once when ill. There are many varieties of tomato. A sun-ripened summer tomato, the size of a tennis ball or larger, is a deep, earthy red. Its skin is taut but its shape is irregular. This tomato has a powerful, inviting musk – redolent of the soil from which it emerged. It is plump to the point of exploding; slicing it reveals the meat, seeds, and juices packed within. Its taste is tangy and sweet. The flesh is the sweetest, while the juices provide an acidic counterpoint, creating a tension that pleasures all the taste buds. So easily is this tomato sliced that one wonders whether it was invented for that very purpose. Plopping a section in one’s mouth initiates a chain of pleasurable sensations, as subtly varied flavors vie for attention on the tongue. Tomatoes require little in the way of chewing and thus can be consumed too quickly, the joy over all too soon. Not surprisingly, an array of accompaniments and preparations has evolved to delay gratification and enhance the enjoyment. For example, tomatoes may be diced and served over rustic bread lightly toasted or grilled, the result being the tomato’s juices fill the bread’s crevices and crannies and create a whole the taste of which is greater than the sum of its parts. A tomato also makes an excellent accompaniment to a cheese such as mozzarella, often served in slices interspersed tomoato/cheese/basil and drizzled with olive oil. 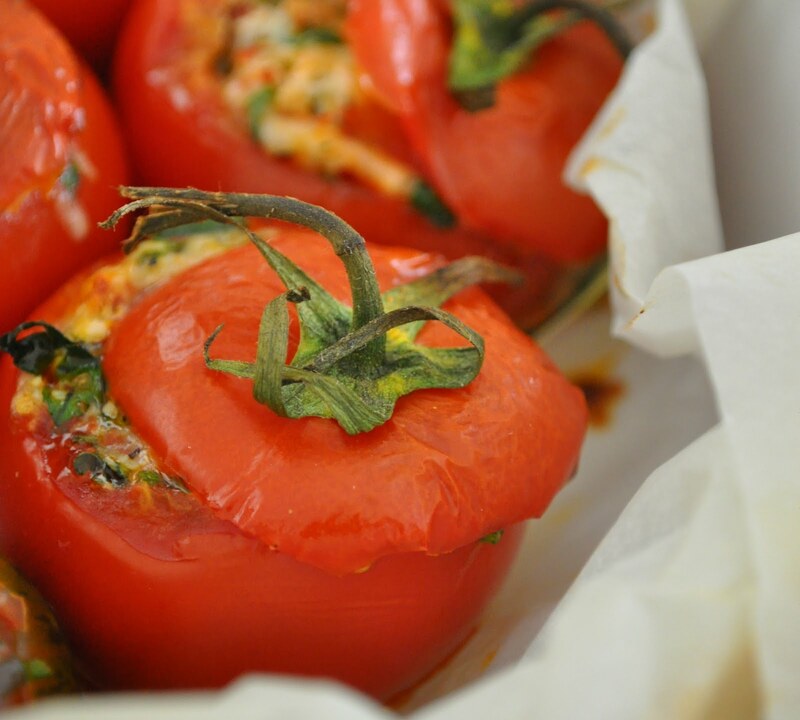 Although tomatoes only entered Turkish cooking about 100 years ago, it has become an invaluable element of Turkish cuisine. Tomatoes or tomato pastes are used in many dishes, including lahmacun, acili ezme, and fasulye pilaki – tomatoes are even featured in breakfast dishes such as menemen. Cut off the tops of the tomatoes and scrape out the insides. Prepare the filling by sautéing the onion with the butter and add the beef until light brown. Add the crushed tomatoes, pepper paste, and beef stock and cook for 15 minutes. Add the rice and herbs. Fill the tomatoes with the filling and cook for 40 minutes. Serve with yogurt and garlic. Cassianus, Bassus. Geoponika: Farm Work: A Modern Translation of the Roman and Byzantine Farming Handbook. 2011, 123-148. The wonderful purslane, semizotu in Turkish, is a part of the Portulacaceae family, which contains around “15 genera and 500 species of herbs or small shrubs” found mostly on the Pacific Coast of North America and southern South America (Brittanica, “Portulacaceae”). According to one article, purslane probably originated in Western North America or South Africa (Prairieland Community Supported Agriculture). According to a Cornell University article, the origin of purslane is very unclear (Cornell University College of Agriculture and Life Sciences). I am not sure how exactly purslane came to Istanbul but it is possible it came directly from Africa or from Greece as it was popular there. (Ibid) It has been found in many archaeobotanical searches in Greece at prehistoric sites so dates way back (The Plant Encyclopedia). Purslane’s ability to produce up to 52,300 seeds in a single plant which “can survive for up to 30 years in undisturbed soil” make it quite popular and may have factored into its quick spread throughout the world (Ibid). Purslane has been found all over the world and according to the Plant Encyclopedia, it was in Crawford Lake deposits in 1430-89 AD, revealing again its spread (The Plant Encyclopedia). While only the leaves are eaten for the most part, the stem can also be eaten. The modern crop in bostans in Istanbul (portulacaceae oleracea scientifically), a potherb grown throughout Europe, contains the green stem and leafs, which are fairly low to the ground (Brittanica, “purslane”). Its wild form is considered to be a weed and contains “small yellow flowers” (Ibid). In terms of requirements for growth, purslane is special in that its known for its longevity as it can grow in “dry waste soil and can retain enough moisture to bloom and ripen seeds long after they have been uprooted” (Brittanica, “purslane”). Thus, purslane thrives in many different environments and conditions. However, the best conditions for growth according to the Plant Encyclopedia, are in “rich, mid-fertility” soil, “medium, well-drained moisture” and a water pH of 7 (The Plant Encyclopedia). It serves culinary purposes today but has also functioned medicinally throughout time in many societies. In the Geoponika, the Byzantine farming manual, purslane is mentioned throughout as helping in the growth and preservation of fruits such as grapes (IV.15) and pomegranates (X.35) (Geoponika 122, 214). Interestingly today, it still functions to support the growth of other vegetables. It states in the Plant Encyclopedia, “Purslane provides ground cover to create a humid microclimate for nearby plants, stabilizing ground moisture. Its deep roots bring up moisture and nutrients that those plants can use” (The Plant Encyclopedia). My first interaction with purslane was at the bostan in Yedikule right next to the church. While taking a number of measurements at different corners throughout the bostan with the hot sun beating down on me, I saw some people I was with reach down to taste a little green leaf. I did the same and once I started, I could not stop. I later learned that little, soft green leaf was purslane (semizotu) and it had the biggest presence in this particular bostan compared to everything else growing in the bostan, presumably revealing its popularity in the area. As I tore off a piece and tasted it, it was if I suddenly became a little kid in a candy store tasting the most delicious piece of candy. It was both refreshing and salty and a bit crunchy. It wasn’t too flavorful but enough so that I could not resist grabbing more (and then buying some right before departing). I loved it for its simple, easy to miss flavor yet its freshness at the same time. In the Geoponika, the refreshing, hydrating quality of purslane is revealed when it says, “The leaf, placed under the tongue, makes one less thirsty” (Geoponika XII.40, 266). This was my first time tasting purslane but since trying it, I have seen it everywhere, often accompanied by a yogurt sauce, which is a very typical Turkish dish called Yoğurtlu Semizotu (below is a recipe for this dish from About.com). I am not a fan of this dish as I think the yogurt drowns the purslane and the person consuming the dish cannot truly taste the green. This could be more a personal preference as I like very simple dishes with minimal sauce. In class a couple weeks ago, we ate purslane with a bit of olive oil and some spices and I thought that was absolutely delicious. I found a “green lentil and purslane salad” in “Time Out Istanbul” which sounds appealing since it is quite simple (Time Out Istanbul). Purslane is a delicious green whose small size contradicts its great presence and functions throughout time. First cut off any roots from the purslane. I always wash and drain it twice to make sure there is no soil or grit left on the leaves. Separate the leaves from the stems. You can save the stems for use in other recipes if you wish. Spin the leaves in a salad spinner to remove any extra moisture. In a separate bowl, whip together the other ingredients using a wire wisk until smooth and creamy. Adjust the amount of salt and pepper to your taste. Add the purslane leaves and mix together well. Make sure all the leaves are covered with the yogurt mixture. You can serve it immediately, or cover and chill it for several hours or overnight. The flavor actually gets better if the salad rests for a while. Gently stir it again before serving. Purslane. Photograph Taken by Rosenthal. August 2014. Bundle of Purslane. Photograph taken by Rosenthal. July 2014. About.com. “Purslane With Strained Yogurt And Garlic Is Called ‘Yoğurtlu Semizotu.’” Accessed 3 August 2014. 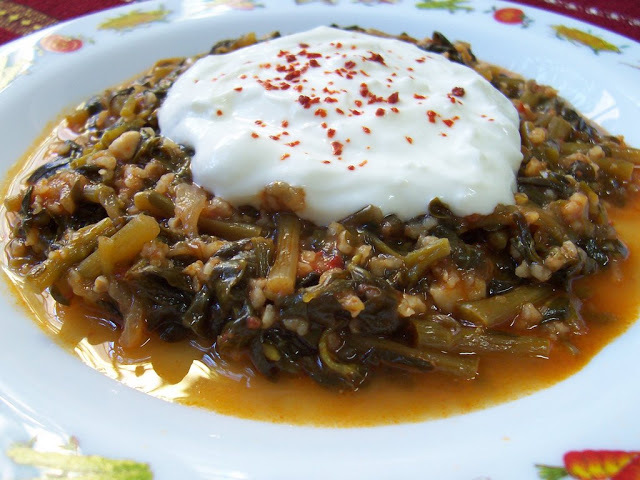 <http://turkishfood.about.com/od/MezeStarters/r/Purslane-With-Strained-Yogurt-And-Garlic.htm>. Cassianus, Bassus. Geoponika: Farm Work: A Modern Translation of the Roman and Byzantine Farming Handbook. 2011. Totnes, Devon: Prospect Books, 9-55 and 246-267. Cornell University College of Agriculture and Life Sciences. “Portulaca oleracea.” Web. Accessed 3 August 2014. <http://www.ansci.cornell.edu/plants/medicinal/portula.html>. Encyclopaedia Britannica Academic Edition. “Portulacaceae.” Web. 3 August 2014. <http://www.britannica.com/EBchecked/topic/471686/Portulacaceae>. Encyclopaedia Britannica Academic Edition. “purslane.” Web. 3 August 2014. <http://www.britannica.com/EBchecked/topic/484198/purslane>. Prairieland Community Supported Agriculture. “Produce Recipes: Purslane.” Web. Accessed 3 August 2014. <http://www.prairielandcsa.org/recipes/purslane.html>. The Plant Encyclopedia. “Portulaca oleracea.” Web. Accessed 3 August 2014. <http://www.theplantencyclopedia.org/wiki/Purslane>. Time Out Istanbul in English. “Istanbul’s top 20 salads.” Accessed 3 August 2014. <http://www.timeoutistanbul.com/en/fooddrink/article/2423/Istanbuls-top-20-salads>. Today in my reading for another class, Yedikule was mentioned. Important to note here is the date of the description and reasoning for picking Yedikule as the location of a new hospital. In the first half of the 19th century, the air was clean and the region was considered “suburban.” Clearly, by the looks of the region today, urban growth has expanded beyond the gardens located at Yedikule and this description doesn’t seem to match up. I also found interesting the demographic of Yedikule. In the reading by Kaldjian he speaks of the different groups of people that migrated in and rotated through the Yedikule gardens as farmers and tenants. Perhaps the existence of the Armenian Apostolic community in the area was a result of an Armenian majority of farmers on the Yedikule gardens at this time. Just something small but interesting I stumbled across! Feel free to share your own thoughts and ideas!